By 2011, a record 5.6 million immigrants from Latin America and the Caribbean had become naturalized, but an even larger number—5.8 million Latin American and Caribbean immigrants—are currently eligible to apply for citizenship but have not done so7. 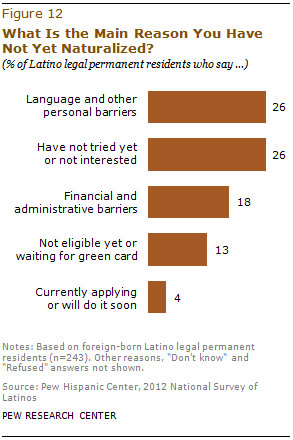 According to the Pew Hispanic survey, about four-in-ten (45%) say the primary reason for not naturalizing is either personal (26%) or administrative barriers (18%). Among those who have not yet naturalized, the desire to do so is great. 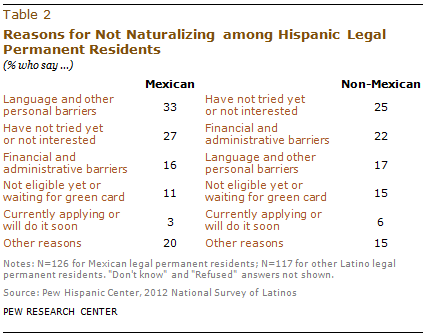 The survey finds that more than nine-in-ten (93%) Hispanic immigrants who have not yet naturalized say they “would” naturalize if they could. Overall, the expressed desire to naturalize is the same among current Hispanic green card holders (including those who have been approved for one) and among those who say they are neither U.S. legal permanent residents nor U.S. citizens8—96% and 92%, respectively.